Whether or not you believe in climate change, what really matters is adapting to the seasons we’re being dealt. It’s key to have a strategy for a late break and a dry season. 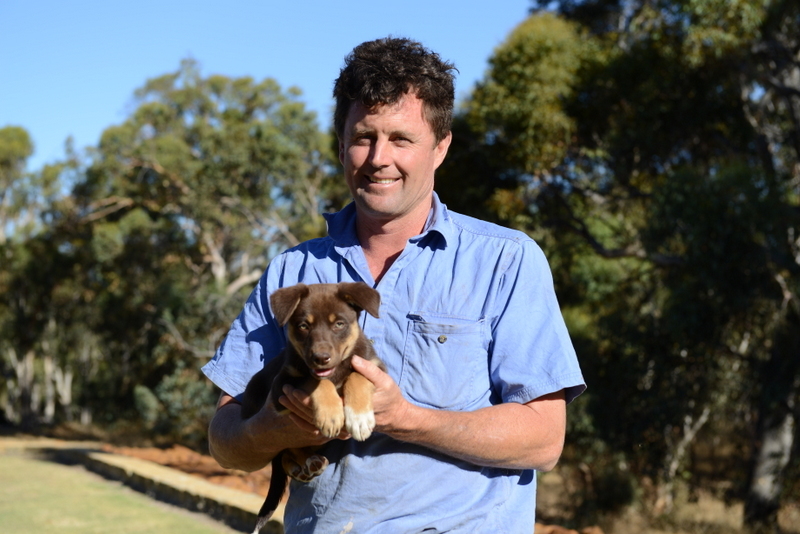 I returned to the family farming operation in 1992, shortly after the purchase of a 3000-acre block in Badgingarra, on rolling country 2.5 hours north of Perth and 70 kilometres from the coast. 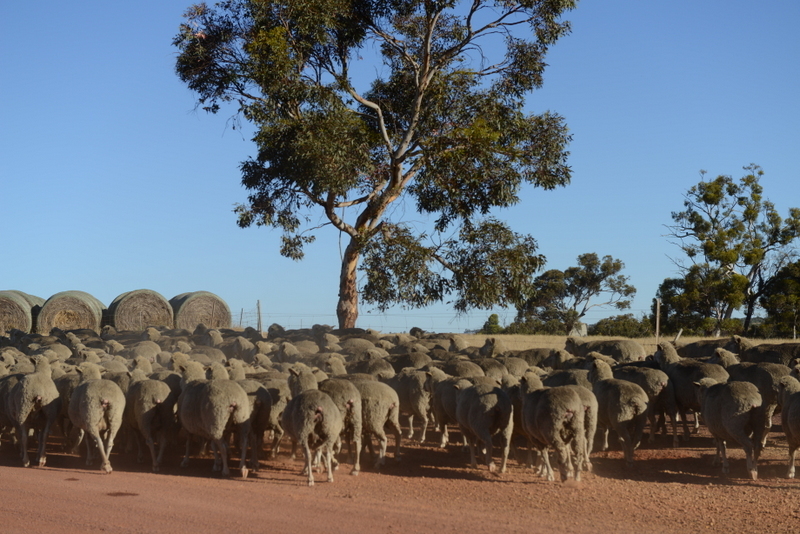 Livestock production was the focus in the Badgingarra district in those days. Ours was a mixed farming operation, with a focus on wool, fat-lamb and wether production, as well as growing lupins and wheat in rotation. The advent of no-till cropping and the introduction of canola into the rotation allowed us to increase the cropping side of the operation. We have been expanding since we purchased the property in 1992 – from 3000 acres to the current size of 8000 acres [3200 hectares]. Our current enterprise is a mix of 70 per cent cropping and 30 per cent sheep, which is pretty typical for this area. When my wife Emma and I became independent of my family’s operation, we really started looking hard at what we were doing and what we needed to change in terms of our enterprise mix and methods of operation. We’ve had some excellent advice from consultants and advisors, and that has contributed to our current operation. In more recent years, the West Midlands Group has been providing some valuable local research and trials. Our district has lost the slow, soaking autumn rains that were a feature of our first years on the farm. The average annual rainfall since 1962 was about 550 mm for this area. But now our typical annual rainfall is about 450 mm. Now, more of our rain arrives in quick, fairly intense events – almost like tropical rains and storms. It exposes us to a lot of gully erosion because it runs off down hillsides quickly. In 2012 we had massive damage when 75 mm of rain fell in half an hour. Winter fronts used to bring rain over 3 to 7 days. Now it’s more like a 24- or 36-hour event with heavier, more intense rain. We rely on fronts and north-west cloud-band events to get any significant rainfall. When they line up at the same time, we can do well out of them. But the fronts just aren’t pushing through the wheatbelt like they used to do – sometimes they barely make the west coast. So, compared to where they sat during the winter, the lows are further south and the highs are very low down, often sitting in the [Great Australian] Bight blocking cold fronts off the coast of Western Australia. Perhaps these patterns are becoming the norm – I believe the sea surface temperature off Western Australia, which has been pretty warm recently [late 2014], can mean more intense weather systems. What the climate scientists were predicting is happening. It’s getting drier and warmer in south-west Western Australia, and they’re telling us this trend will continue. Our seasons have shortened. We used to have a traditional early-May break. Now it’s moved back a bit: the autumn break is now like a winter break. We are now in a different climate. It’s not just a short-term cycle; it could be a long-term change. And we’ve got to adjust and farm accordingly. We sowed about 75 per cent of our program dry in 2012, which can get a bit nerve-racking later in the season, but in 2013 and 2014 we were able to sow wet. Having rainfall in early May in those years was very fortunate. When those rains happened, we delayed sowing a little, let the weeds come up and then knocked them down prior to seeding, which gave us another shot at the weed bank. If we can’t complete seeding before 10 June, we get into a situation where we have to start sowing dry. The yield penalties after that date are pretty high, and getting worse with hotter springs. Of course if it doesn’t rain right through the season, then dry seeding would be the wrong decision. But generally we bank on getting a rain at some stage. As for crops finishing, last year  they finished very early because of a very warm August. It was a record early start to our harvest – 3 weeks earlier than normal. The crops became heat stressed and started haying off. It was lucky that September was quite wet and relatively cool, which made up for a little bit of crop damage in the record August heat. When we started farming here, we initially ran a minimum-till system, working the soil just once when we put the crop in. Our biggest problems in the ’90s were getting the crop in before it got too wet and combating crop damage from machine tracks. So we moved to a no-till system to overcome these issues, using knife point sowing with press wheels. The soil holds more moisture this way and, because the deep blade system does not disturb the soil, trafficability isn’t a problem anymore. The furrows also collect water. No-till made the country more viable to crop and stopped a lot of the erosion problems that we had. 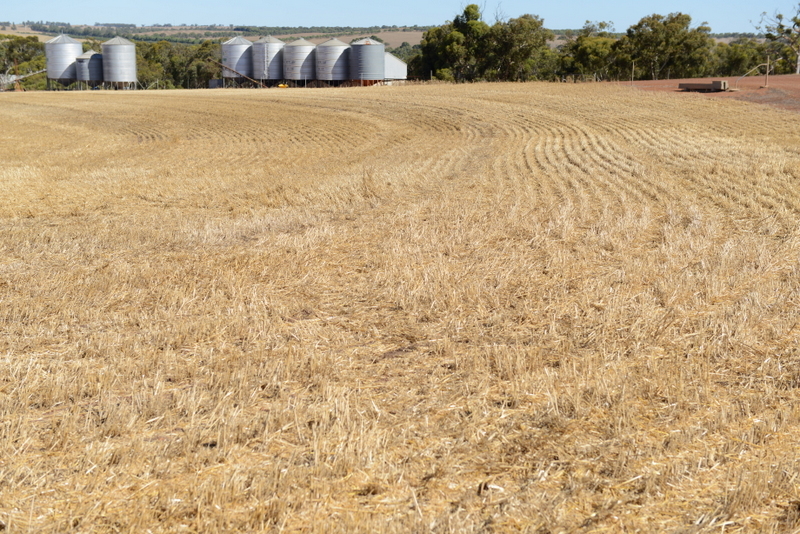 Stabilising the soils has made a huge difference to our productivity. Because it has been drier since 2000, we’ve had to think about how to conserve soil moisture. 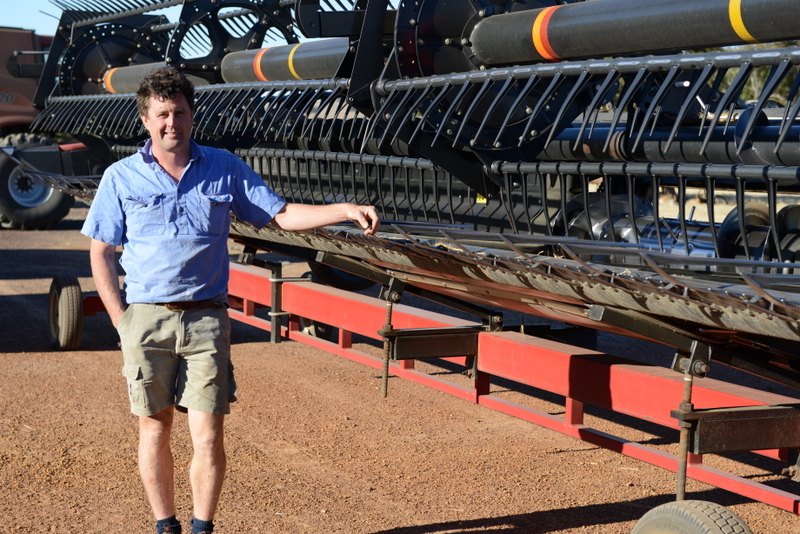 We can sow on smaller rain events and get the crops going earlier, leading to higher yields. A problem with no-till, though, is that after 6 or 7 years of it, we seem to be getting bigger areas of non-wetting soils developing. We’re spending a lot of time trying to overcome that. 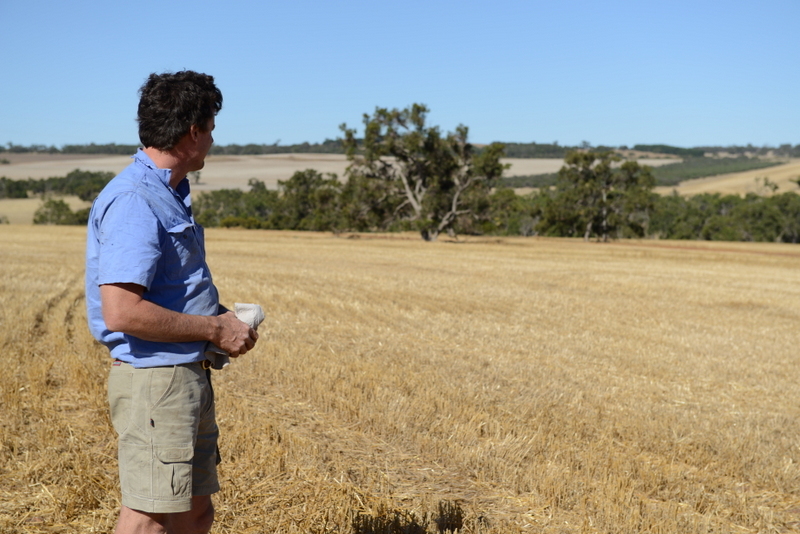 We have mainly Mallee gravels on our property, plus some yellow sand-plain soils and some heavier white-gum clays. One of the biggest challenges we still face is the problem of non-wetting soils – it’s partly a side-effect of no-till farming. I find it quite baffling to go out on the paddock after an inch of rain and be able to pick up topsoil that is still dry. It will be wet at 10-15 centimetres and in the top half-centimetre, but the middle is completely dry. The change in climate and loss of autumn rain exacerbates this problem. What we need is the water to soak in where it lands. If we can’t get a crop established on the first rain event, we’ll lose critical growing periods. We have done some mouldboard ploughing, which is using a traditional, big, old plough to invert the soil. It brings the clay to the surface and, hopefully, buries the non-wetting soil along with weed seeds. The success of that technique is very soil-specific – some of our soils have responded really well to it, and some haven’t responded so well. I think we’ll use it in future with caution because you’re pretty prone to erosion for the first 12 months after you do it. We will also do more spading and claying, which are a little less aggressive on our soil types. Claying is about finding suitable clay, digging it up, spreading it over the soil and incorporating it into the surface. Spading is a less-aggressive form of rotary hoeing the top 30 centimetres of the soil to bring wettable soil upwards and move the dry topsoil down, while mixing the applied clay through. It’s expensive, but the results are encouraging. We can also incorporate lime at the same time. The lime combats soil acidity to let the roots go deeper and use the moisture they find there. That’s especially important for finishing crops and pastures. We’re fortunate to be very close to a lime source, which allows us to address it fairly cost-effectively. Generally, we’ve already addressed our surface pH. It’s the sub-surface pH we’re trying to address, now, with the ploughing, spading and incorporating lime at depth. With the general drying trend, we can’t rely on an early break now, so we’ve got to have a strategy to accommodate a late break if that eventuates. In the case of an earlier break, we like to be able to plant a longer season variety. But we’ve always got some short-season ones on stand-by, to give us flexibility. That’s particularly important for canola, because it’s the first crop we put in for the season. Generally, the break comes about in late April/May. If we sow in late April or early May, the next 3 weeks are a very warm growing period, which accelerates the crop growth a lot. Those long-season crops also rely on a good spring finish, which doesn’t always happen. But if we have to delay planting and use shorter season crops, they will germinate a little later – in early June. That’s one way to deal with a later start and, sometimes, an earlier finish. Scientists are predicting – and it seems to be happening – that we’ll get higher springtime temperatures, and right through winter. It’s causing accelerated crop development – we’re hitting crop stages earlier than we would otherwise. That acceleration can cost us yield. So it’s critical to get the crops established early and well, to get them growing through the cooler winter months to maximise yield. We have had to make changes to our farming strategy over the last 20 years. Climate has been a big factor in changing the farming patterns in the district. The lower rainfall has encouraged people to take up no-till and steadily move from sheep to cropping. Whether or not you believe in climate change, what really matters is adapting to the seasons we’re being dealt and having strategies in place, particularly for this dry phase. It’s key to have a strategy for a late break and a dry season. I like to have something in place before the growing season commences, and to have flexibility built into the system. Those practices have worked really well for us in those dry years – they let us vary our plans according to commodity prices and the outlook for rain. For example, with our sheep operation, we’ve moved to August lambing. This means we avoid relying on an early break to feed lambing ewes. We can offload sheep through the middle of winter without having to worry about dealing with lambs and the complications they may cause at that time. Peak demand for feed aligns with peak pasture growth. Sheep work in our system fairly well and the outlook for livestock is pretty good at the moment, so we’ll stick with them. On the back of some better seasons, we’ve increased our stock numbers slightly and grown more barley than we used to. The barley stubbles are very useful feed for the sheep over summer. 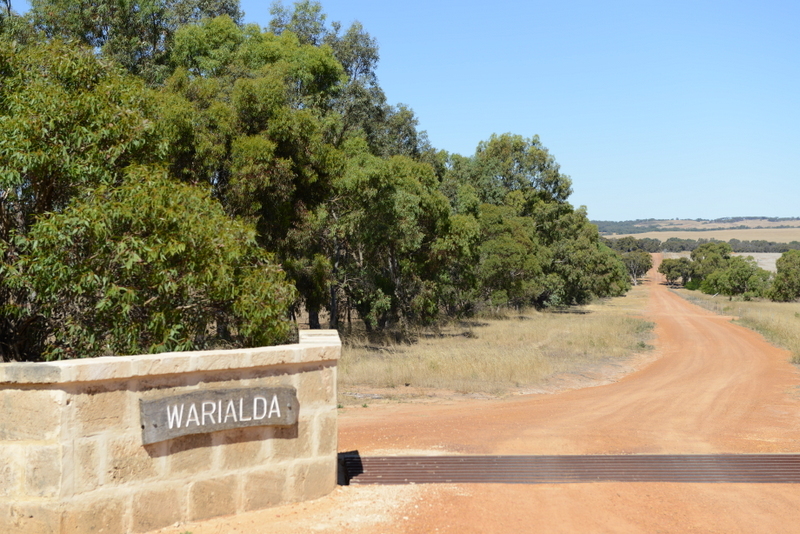 Recently we purchased a property 40 kilometres west of Badgingarra. It’s part of our strategy to deal with drier seasons in this area, to give us flexibility and diversity. Being about 15 kilometres from the coast, the property picks up a bit more rain from every cold front that comes through and is cooler through the critical spring finishing period. The higher rainfall and cooler spring period is great for pasture growth and finishing crops. Forecasting is a fascinating area, and it’s so important to us in decision-making. It is a constantly evolving and improving tool. We plan our weeks around 10-day forecasts, and adjust our cropping plans accordingly. We are always looking for new programs and models that work. I look at them all first thing in the morning, see which ones agree, and make a best guess out of those forecasts. If the Bureau of Meteorology’s (BOM) forecasts agree as well, that gives me even more confidence. For this area, a few models seem to work better than the others. NOAA’s Global Forecast System is one. Its 7-day map representation is generally pretty good. The BOM MetEye forecast is very good. Compared to 10 years ago, it’s so much more accurate. You can pretty much rubber-stamp them when they come through: that’s pretty much what’s going to happen. We also look at the 7-day consensus forecast from Australian Weather News, which I think uses all the 9 models that BOM uses. It gives a percentage of the models that are predicting rain for the week ahead. With seasonal outlooks, we’ve now become used to the fact that they can change pretty quickly. I guess we’re aware of the limitations that they’re dealing with. They are getting a little better. It’s something you don’t put huge stock in, but it’s there at the back of your mind when you’re making fertiliser or stocking decisions. There’s a lot more monitoring going on in the Indian Ocean now and that’s going to be really good for accuracy of forecasts for Western Australia, in particular. POAMA [a seasonal climate prediction model] is pretty good for the guys south of Perth, but it tends not to be a good predictor for our area because we’ve got a combination of north-west cloud bands, tropical cloud bands, middle-level disturbing events and winter fronts. 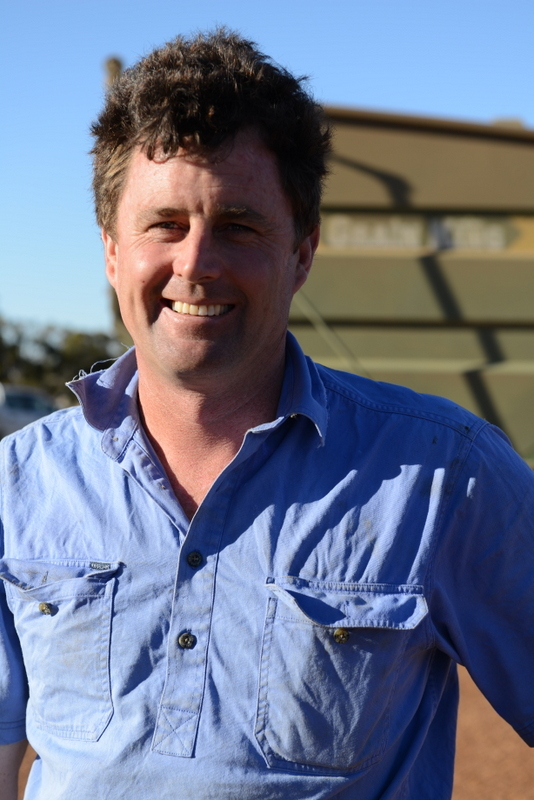 It’s been great to have access to other farmers across Australia: particularly in Western Australia, talking to the guys in the south-eastern wheatbelt and the North Midlands. We can compare notes and stories about what’s working for them and what isn’t. It’s terrific to hear a diversity of views and experience from across Australia. It’s also been good to talk to people in the Bureau of Meteorology, CSIRO and other research professionals. I’d recommend that other farmers get involved.